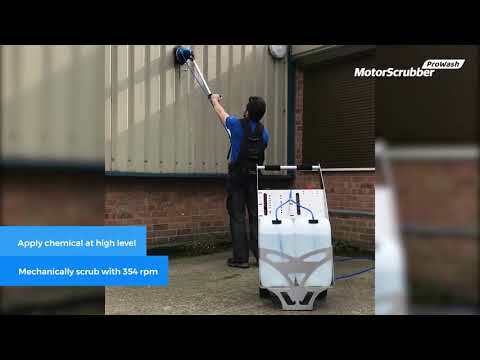 Exterior surfaces have always been a problematic area to clean; manual methods are very labour intensive, often with poor and disappointing results, this is why the MotorScrubber ProWash was developed. The cleaning results from 354 rpm are outstanding making light work of heavily soiled surfaces. ProWash is ideal for cleaning vinyl siding, cladding, guttering, commercial signage, trucks, trains, planes, boats and any large vehicle. Capable of spraying chemical where other systems use only pure water. In many cases, this is not suitable and chemical is a must. Very simple to use, no need to learn complicated controls. Plug and go! For an all-in-one professional cleaning system, ProWash is the only choice.